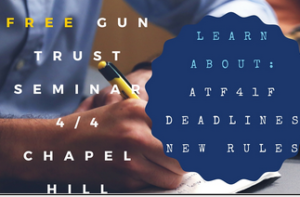 North Carolina gun trust attorney Greg Herman-Giddens will host a free educational seminar in Chapel Hill on Monday, April 4th about gun trusts and the forthcoming federal regulation changes in ATF 41F. April 4th marks 99 days until ATF 41F takes effect. Firearms owners have a short time left to understand the changes in federal law and to take action to ensure that their gun trust documents are in compliance. ATF 41F is a rule that will take effect on July 13, 2016, imposing new regulations on how gun trusts, Limited Liability Companies (LLCs) and other entities hold and manage NFA firearms. Many responsible firearm owners use gun trusts as a means of legally and carefully handling their firearms, and planning how these items will be transferred to loved ones upon death or incapacitation. Estate planning for firearms has always required careful guidance and a clear understanding of state and federal law. The forthcoming regulations in ATF 41F will prompt many gun owners to review and revise their estate plans. Southern Gun Law Group’s Free Gun Trust Seminar: Gun Trusts and How They are Affected by ATF41F takes place at 6PM at Extraordinary Ventures, 200 South Elliott Street in Chapel Hill. Light refreshments provided. Seats available only for those who register in advance – seating highly limited and RSVP required prior to 3/23. Register for the seminar here.